I am the worst, most inconsistent reviewer EVER. I keep telling myself to start reviewing books after I read them, at least during the same week. I keep telling myself it is harder to write reviews the longer I wait, or the more time and books pass. I keep telling myself the reviews may miss small tidbits I'd otherwise remember if I'd just review them ON TIME. Do I do this? Do I keep reviewing on a dependable system that makes sense and keep up with my goals? Well, apparently this shark thinks that is just too funny. It's especially frustrating with series books when I read one in the series and should review it before reading the next. That way the enthusiasm for each book and details of what's in what book would be clear. Reviewing books in a row after reading several in the series in a row just stinks. I can only hope that one day I will get a routine going on that I stick to and review on a consistent basis. Because, to continue this visual exchange, that would just be happiness and rainbows. I never use GIFs, I'm not a fan of them, but having the shark theme and being made to use them for this post actually turned out pretty fun. 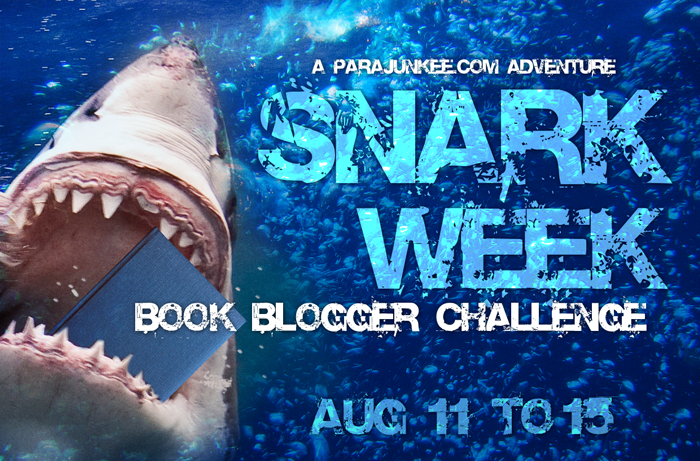 Looks like Snark week is over - it was fun to do these posts. Hope you enjoyed reading them.